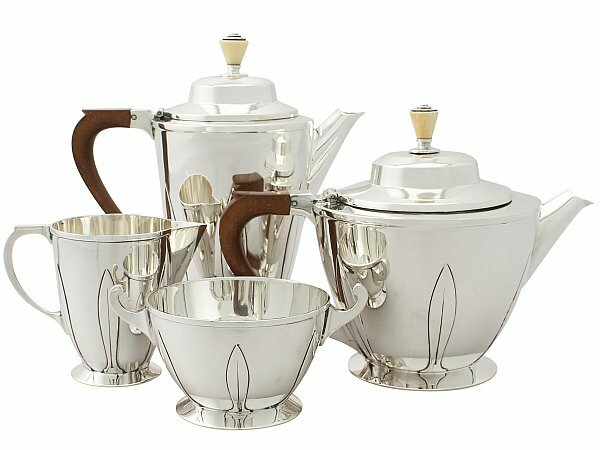 This fine antique George V sterling silver tea and coffee service consists of a coffee jug, teapot, cream jug and sugar bowl. The pieces of this Roberts and Belk silver tea set have a plain circular rounded form onto a circular spreading foot. The surface of each piece of this exceptional Art Deco tea service is plain and encircled with applied simplified elongated leaf designs. The teapot and coffee jug are fitted with domed, hinged hallmarked covers, retaining the original iconic Art Deco style conical shaped finials, securing to the interior with wing nuts. The coffee jug and teapot are fitted with the original, fine and impressive rounded wood handles featuring a plain curved thumbpieces. The cream jug is fitted with a rounded sterling silver handle, reflecting the same design as the wooden handles to the teapot and coffee jug. The sugar bowl features two plain sterling silver handles with plain scrolling upper terminals. The underside of each piece bears the retailer's mark/icon (Aladdin's lamp) of James Dixon in addition to the full hallmarks. This antique sterling silver Roberts and Belk silver tea set is a very good gauge of silver, excellent quality and in exceptional condition. The tea set has been professionally polished and is in presentation condition. Full hallmarks struck to the underside of each piece and part hallmarks to the rim of each cover are all very clear. Reflections in photographs may detract from the true representation of this impressive example of antique Art Deco teaware. Length from back of handle to tip of spout 17.7cm/7"
Length from back of handle to tip of spout 14.3cm/5.6"
Length from back of handle to tip of lip 11.3cm/4.4"
Height to top of handle 5.8cm/2.3"